The bioactive compound stability of freshly squeezed juice from oranges (Citrus sinensis, L.) that were subjected to high-pressure (HP) treatment was studied by measuring flavanone content and antioxidant activity. High hydrostatic pressure is a food preservation method used as an alternative to heat treatments. 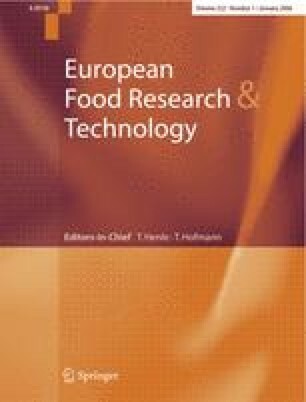 Therefore, it is essential to assess the impact of HP on bioactive compounds, and related health-promoting attributes of orange juices. Several processes, which combine high-pressure treatment with heat treatment for various time periods, were followed: T0=fresh (without treatment), T1=100 MPa/60 °C/5 min, T2=350 MPa/30 °C/2.5 min, and T3=400 MPa/40 °C/1 min. Fresh and treated samples were kept chilled (4 °C) over 10 days. After application of HP and during the chilled period, the qualitative and quantitative determination of flavanones (naringenin and hesperetin) was achieved by HPLC. Also, the radical scavenging activity of juices was assessed by the 2,2-diphenyl-1-picrylhydrazyl stable radical. T2 and T3 treatments led to an increase in the extraction of flavanone content. Flavanone content after the 10-day chilled storage period resulted in no significant quantitative changes. Radical scavenging activity was unchanged immediately after HP treatments and over the chilled storage, except in the case of T1 treatment, where it was depleted. Thus, the tested upper range (350–450 MPa) of HP treatment of orange juice led to an increase in the extraction of flavanones. In addition, the fresh-like quality of freshly squeezed orange juice over the chilled storage period tested, in terms of potential health-promoting attributes in the juices, was retained.